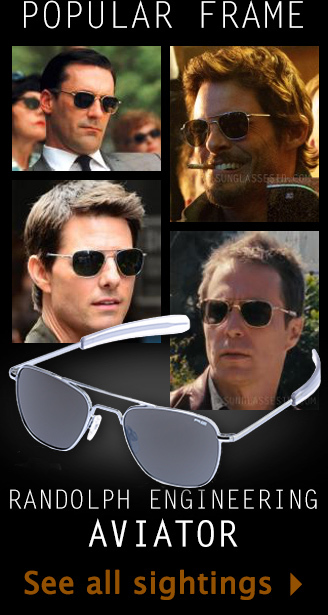 In some films and tv series you can spot different types of Ray-Ban Aviator sunglasses, some with a large bar above the nose, the Ray-Ban Outdoorsman sunglasses. There are several different variations of this model available, which we will compare in this article. When shopping for Aviator sunglasses you need to make sure you get the right size of the model, which is hard to see online, but we have made an easy Ray-Ban Aviator, Outdoorsman and Shooter size comparison table as well. Everybody knows the classic Ray-Ban Aviator sunglasses, which was originally designed for U.S Aviator pilots, and now the best selling sunglasses, seen in many films and tv series. The RB3025 currently comes in three lens sizes: 55mm (small/medium), 58mm (medium/large), and 62mm (large, XL) and is available in dozens of color combinations (even a Limited Edition in pure gold) and a model with folding frame. The model, like many Ray-Bans, is avilable with or without Polarized lenses. You can recognize Polarized lenses by the P next to the Ray-Ban logo on the right lens (although prescription sunglasses usually don't have a Ray-Ban logo or P on the lens). There is also a model called RB3026 Aviator II, which is basically the same model as the RB3025, but the RB3026 only comes in the large size 62mm lens and a few select colors. As mentioned before, the RB3025 is available in 55mm, 58mm and also the 62mm lens size, and is available in many more colors than the RB3026. 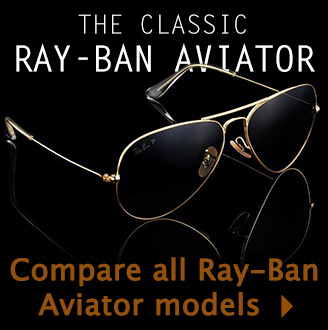 Buy the Ray-Ban RB3025 Aviator on Amazon.com, FramesDirect or eBay. Let's take a look at what is the the difference between the Aviator and the Outdoorsman, the difference between the Outdoorsman and Outdoorsman II, and what is difference between the Ray-Ban 3029 and 3030 and 3407 and 3422 models, and what makes the Shooter different from the Outdoorsman. The Outdoorsman II RB2029 is available with a gold frame and brown sweat bar, or in black frame and bar. The classic Aviator is available in many more color combinations and sizes than the Outdoorsman. The difference between the Outdoorsman II RB3029 and Outdoorsman RB3030 is quite simple: the Ray-Ban Outdoorsman RB3030 has temples that are rounded, the so called "cable temples", so they will keep the sunglasses fixed more securely behind your ear, while the Outdoorsman II RB3029 has more modern, straight arms. In addition, the RB3030 has a smaller, 58mm lens, compared to the RB3029 with its 62mm lens. The Outdoorsman models are often seen in films as well, worn by Sylvester Stallone for example. Find all Outdoorsman movie sightings. 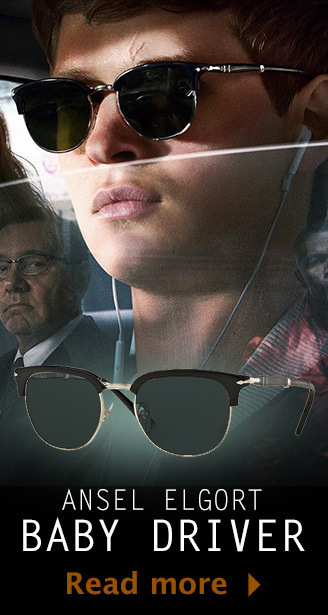 Buy the Ray-Ban Outdoorsman RB3030 on Amazon.com, FramesDirect or eBay. Buy the Ray-Ban Outdoorsman II RB3029 on Amazon.com, FramesDirect or eBay. The "Rainbow" variation of the Outdoorsman II has, according to Ray-Ban "an added touch of retro. The Outdoorsman II Rainbow lets you fashion one of the most iconic sunglasses out there, while still standing out from the crowd." It is a smaller model of the Outdoorsman, available in two sizes (55mm or 58mm, while the RB3029 has 62mm lenses). The Rainbow is available in other color variations, for example with this pink brow bar pictured above. Buy the Outdoorsman II Rainbow on Amazon.com. The last variation of the Outdoorsman is the Ray-Ban Outdoorsman II Craft RB3422Q. The difference between this model and the other Outdoorsman models is that the brow bar (sweat bar) and the temple pads (ends of the arms) are crafted with genuine, hand stitched deer leather. Only available in the medium size 58 (58mm lenses). The Craft is available with tan leather, brown leather and black leather. Buy the Ray-Ban Outdoorsman Craft on Amazon.com. Finally we take a look at another Aviator model that is similar to the Outdoorsman: the Ray-Ban Shooter. The Shooter model is similar to the Outdoorsman model in that is a has an acetate brow bar or sweat bar, but it also features a little circle just below the brow bar. The 58mm lenses stand closer to eachother than with the other Aviators or Outdoorsman sunglasses. The origin of this circle is being debated, some say it helps during shooting or hunting, but Ray-Ban calls it an "aviation-inspired feature, a vanity bullet hole in the center of the frame". 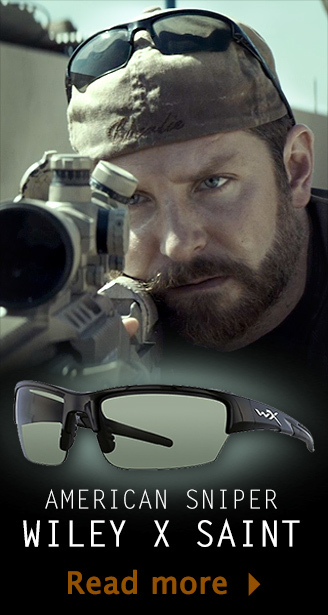 The Shooter slasses also have especially thin temples to enhance wide peripheral vision. These glasses were made famous by Johnny Depp who wore this model in the movie Fear and Loathing in Las Vegas. His character wore the glasses because Hunter S Thompson, on who the character was based, often wore Shooter glasses. Important: when shopping online for sunglasses, make sure you order the correct size. 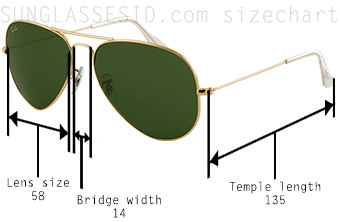 Aviators are available in 3 different sizes, and some of the Outdoorsman glasses also have different sizes. The size is usually 55mm, 58mm, or 62mm, and this number is usually, but not always, mentioned in the code of the model.